Keone Reyes of Kaimuki drove to the basket against Kamehameha during last night's semifinal. Reyes scored 10 points in the Bulldogs' win. Beau Albrechtson just wanted to keep the Bulldog party going. "There's so much hype going around school, I don't want it to end," he said. The hype will continue for at least one more night, as the junior forward converted four of six free throws in the final 27 seconds of overtime to lead the second-seeded Bulldogs past unseeded Kamehameha 46-41 last night in the semifinals of the Hawaiian Airlines/HHSAA Boys Basketball State Championships at Stan Sheriff Center. The Bulldogs advance to tonight's championship against top-seeded Iolani at 8 p.m. It's the first appearance for the Bulldogs in the championship game since winning the state title in 1993. The Raiders, who beat Kahuku 60-36 last night, are the four-time defending state champions. "I'm shaking right now," Bulldogs coach Kelly Grant said. "I thought we were in trouble going into overtime, but these kids weren't. They're too overconfident." Albrechtson led the Bulldogs with 11 points and 13 rebounds and Keone Reyes overcame a rough start to score eight of his 10 points in the final 12 minutes, but the Bulldogs had to overcome a late Warriors rally that sent the game into overtime. Trailing by seven with under 3 minutes to go, Kamehameha got back-to-back three-point plays from Rykin Enos and Andrew Godinet to cut the lead to 32-31. The teams traded baskets until a layup by Reyes gave Kaimuki a 38-35 lead with 1:02 to go. After a timeout, Godinet swished a 3 from in front of his own bench to tie the score at 38 with 18 seconds left. Kaimuki got the ball back, but Albrechtson's bucket with 5.8 seconds left was waved off after he was called for a charge. Enos had a shot to win it for Kamehameha, but his runner failed to hit the rim as time expired. "After they got that charge call, which could have gone either way, they had all the momentum," Albrechtson said. "Coach told us we had to pick it up or they were going to run all over us." Both teams started the overtime shaky, turning the ball over on each of their first two possessions. After a basket by Reyes put the Bulldogs up by two, Enos converted a free throw, and Pono Hanson's jumper with 1:20 remaining gave the Warriors their first lead of the game. But Kamehameha missed its final five shots and the Bulldogs hit six of eight free throws in the last minute to pull out the victory. "Give credit to them, they played good defense and made their free throws," Kamehameha coach Jesse Nakanishi said. "This is a special group of kids that never gave up and were in every game. The ball just didn't fall our way." Enos led the Warriors (12-4) with 16 points and Jacob Ho added 10 despite fouling out in the overtime period. Kamehameha was outrebounded 33-24 and shot just 31 percent from the field. "In a game of this magnitude you have got to let us play," Ho said. 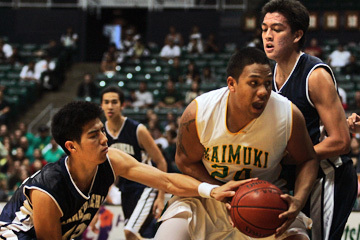 "Kaimuki played hard, especially in rebounding. From the beginning, they killed us." The Bulldogs (14-2) finished 19-for-26 from the free-throw line and shot 38 percent from the floor despite 18 turnovers. "We've known all year we got the weapons," Reyes said. "Once we get them rolling, nobody can stop us." KAMEHAMEHA--Randy Cummings 0, Jesse Moniz 0, Brandon Ahlo 0, Andrew Godinet 8, Mitchell Kauweloa 1, Jacob Ho 10, Pono Hanson 6, Rykin Enos 16, Jay Kauka 0, Mark Mokiao 0, Kea Smith 0. KAIMUKI--Daniel Colon 8, Alika Higa 0, Shaun Dela Calzada 9, Shadrach Ramos-Dias 2, Keone Reyes 10, Jarett Shiu 6, Beau Albrechtson 11. After playing most of the season as a swingman, the Warriors put Chris Aiwohi-Kegler in the post. The 6-foot senior responded with 24 points and 15 rebounds. Mea Wong added 12 points for the Warriors. Aiwohi-Kegler shot 14-for-17 from the foul line, including two free throws with 2 minutes left, to give the Warriors the lead for good at 50-49. KAMEHAMEHA-HAWAII--Chris Aiwohi-Kegler 24, Mea Wong 12, Mana Silva 8, Kealoha Kramer 3, Kupono Kaleohano 3, Reece Alnas 9, Jacob Naki 0, Kalani Aldrich 0. CAMPBELL--Raymond Samante 0, Ryan Hayes 5, Mike Makinano 18, Matthew Samante 8, Michael McDonald 0, Jayden Delizo 4, Tristan Sealy 10, Walter Daniels 0, Terence Tafai 0, Sean Kelly 2, Dexter Vanhook 7. 3-point goals: Kamehameha-Hawaii 1 (Kaleohano), Campbell 3 (Makinano 2, Hayes). Kahuku Hollinger sparked a fourth-quarter run and finished with 20 points as the Mustangs advanced to the fifth-place game. Hollinger shot 8-for-14 from the field, including 4-for-7 from the arc. Center Tyler Caswell, a 6-5 junior, grabbed nine rebounds, and Marvin Judd added 11 points for Kalaheo (21-11), the OIA third-place team. Jordan Helle, a 6-2 sophomore, led the MIL champion Bears (21-11) with 10 points. BALDWIN--Jeff Tumacder 0, Michael Marrs 0, Micah Shibano 0, John Cabael 0, John Salmo 7, Chase Nakamura 6, Rhys Alvarado 0, Matt Heyd 8, Nick Wagner 6, Jordan Helle 10, Sean Tesoro 0. KALAHEO--Elias David 2, Chris Tumaneng 4, Koa Siliga 2, Mana Guerreiro 0, Kahuku Hollinger 20, Marvin Judd 11, Cheynne Lishman 4, Jeff Whitworth 0, Chase Moses 0, Deaux Burns 0, Tyler Caswell 6. 3-point goals: Baldwin 1 (Heyd), Kalaheo 4 (Hollinger 4). Cameron Bayne scored 18 points and Jacob Barit added 14 off the bench to lead the Crusaders (16-5). Saint Louis outrebounded the Lunas 42-28 and committed only seven turnovers. The Crusaders also shot 52 percent from the field (34-for-66) to overcome 9-for-24 shooting from the foul line. First-year player Saia Taufa led Lahainaluna (14-12) with 17 points and 11 rebounds. LAHAINALUNA-- Zac Bali 0, Raymond Liew 2, Julio Arvizu 6, Saia Taufa 17, Dillon Soldwisch 0, Michael Mishima 2, Reimers Pinho 0, Paul Salvador 4, Eric Emmel 0, Matt Perry 10, Jordan Arakawa 0, Mau Ah Hee 11, Chris Wanke 2, Matthew Lawless 0. SAINT LOUIS--Ricksson Pacarro 0, Kuli'a Aiona 0, John Quindara 2, Kawika Kekuawela 3, Scott Smith 6, Cameron Bayne 18, Joshua Yuen 3, Cole Shidaki 4, Solomona Aigamaua 2, Kalua Noa 3, Jeremiah Masoli 13, Elliott Purcell 7, Jamison Miller 4, Jacob Barit 14. 3-point goals: Lahainaluna 5 (Arvizu 2, Perry 2, Salvador), Saint Louis 2 (Kekuawela, Masoli). Chris Newcomb scored nine points and the Menehunes closed the game with a 13-4 run. The Kauai Interscholastic Federation champions shot just 25 percent (9-for-36), but were 16-for-26 from the free-throw line (62 percent). Alden Lahip added seven points for Waimea, which trailed 7-1 after one quarter but was not deterred. Honokaa (22-9) shot 28 percent from the field (10-for-36) and committed 20 turnovers. HONOKAA--Komakana Fernandez 0, Tramaine Baquiring 1, Ike Shigematsu 0, Jestin Salazar 3, Jacob Galdeira 4, Efren Gonzales 2, Kapena Dela Rosa 0, Jessie Robianes 0, Kaena Lukzen 0, Jonathan Salsedo 0, Kyson DeCosta 2, Kien Aveiro 5, Auwae DeRego 2, Damien Sabater-Hart 6, Thomas DeRego 2. WAIMEA--Kyle Achuela 2, Chad Barba 5, Vincent Vea 0, Braxton Garma 1, Alden Lahip 7, Kasey Okihara 0, Bradley Frasco 1, Roldan Villanueva 0, Calsen Agrade 2, Brendan McDaniels 6, Dana Tayco 1, Keelan Sakuda 0, Chris Newcomb 9, Vincent Geronimo 1. 3-point goals: Honokaa 2 (Salazar, Aveiro), Waimea 1 (Lahip).